Try cleaning suede boots with vinegar. Suede shoes are difficult to care for. This is because suede is sensitive to water and weather. 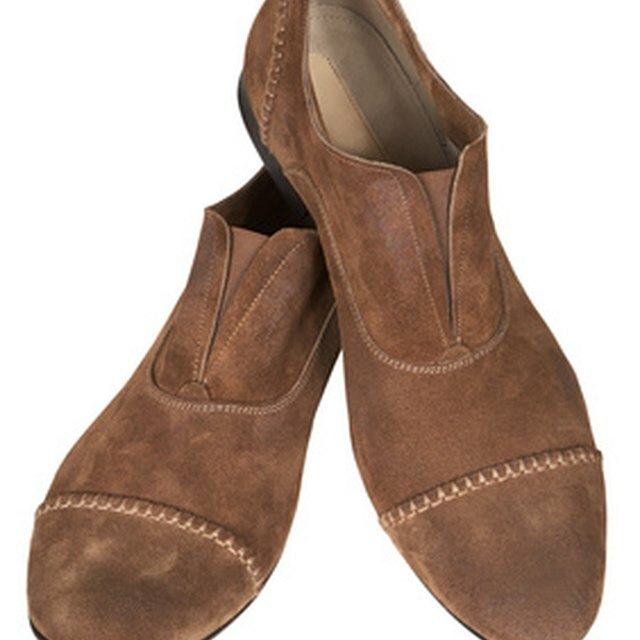 Moisture causes the soft, luxurious look of suede to become uneven and coarse. One of the best ways to steer clear of stains on suede boots is to avoid wearing them in moist weather, or in areas where rock salt has been thrown on the ground. However, if you are unable to avoid inclement weather, try cleaning suede boots occasionally with vinegar, which is known for its many uses and cleaning qualities. Go over the boots with a suede brush. Suede brushes have rubber bristles. Rub back and forth in short strokes over any major stains, then use long strokes for the entire boot. Add one tbsp. of white distilled vinegar and mix well. Dampen a lint-free cloth with the vinegar and water solution. Do not soak the cloth or use a cloth that is not lint-free and colorfast. Certain cloths and paper towels leave annoying fluffy pieces behind and even transfer color. Wipe the entire suede boot down with the damp lint-free cloth. For tough stains, apply a few drops of vinegar directly to the area and rub with a soft-bristled toothbrush. Let dry before wearing. How Can I Make My Rain Boots Stop Stinking?